It amazes me every year how I think that Summer will be a time of catching up on projects and also a time of leisure. I am delusional. Every year the reality is I have people home all day everyday. Having them here is a joy but it also means that the time I have to spend sewing decreases. I love them here so my schedule gets readjusted to accommodate them being home full time. For the past few days I have been sneaking in a variety of sewing projects while still being available to the kids. This week I added to my collection of blocks for The Splendid Sampler with this beauty using fussy cuts, Liberty of London and Zen Chic Modern Backgrounds for Moda. 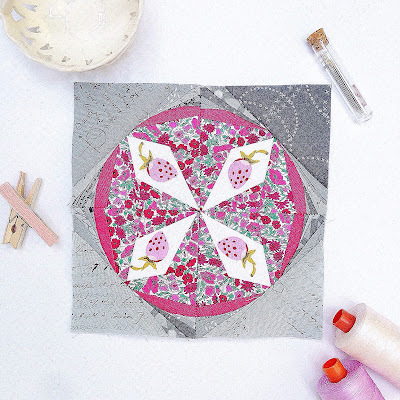 For this free paper pieced block please visit The Splendid Sampler! In about three weeks my son and his lovely wife will be welcoming a new baby into their family! They have two adorable boys and now they are having a girl! With this news, I realized I still have to do the quilting on the quilt top I put together for her! YIKES! 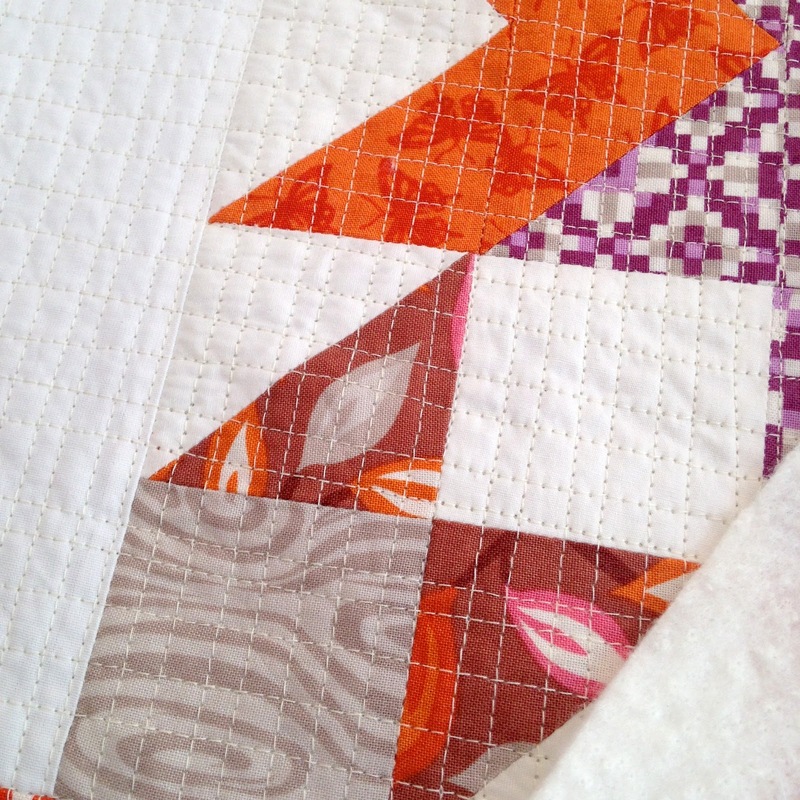 I have not quilted anything in a very long time and was hesitating since I did not want to mess the quilt up! I started out on my regular machine but then noticed that the upper tension was completely WHACK! I had to grab Jack ( my seam ripper) and rip out ALL of the quilting I had been working on. I was not pleased. Luckily, I have a small collection ( my family would say it is a large collection) of vintage machines that I adore. I was going to use my Singer 301 but my Viking was closer so I set it up on the dining room table. She went right to work without any tension issues! I am a happy Go-Go Gran! Plus she is just pretty! 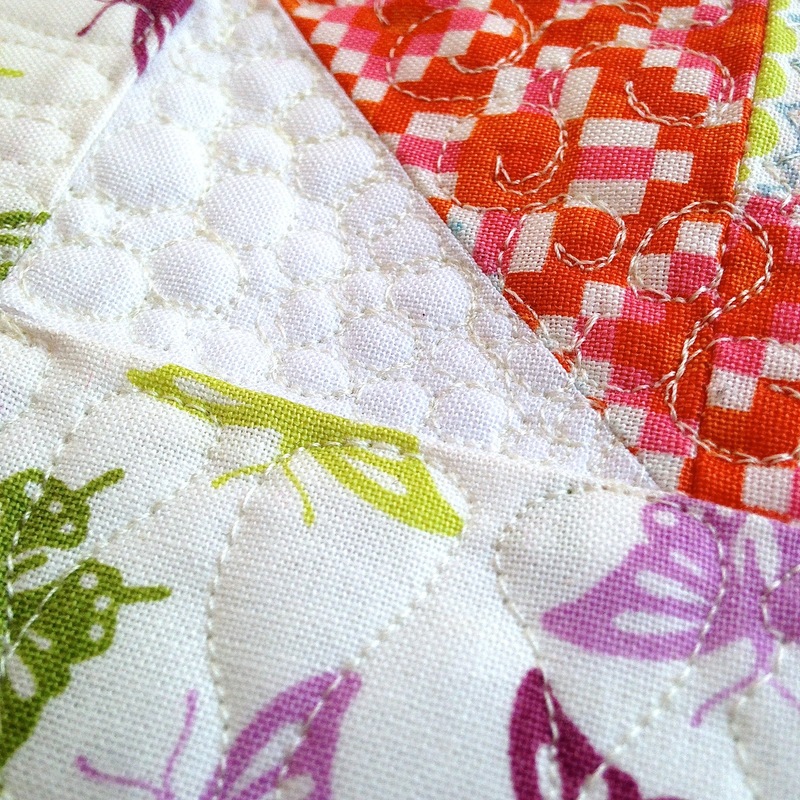 This week I have also been working on my Aurifil Block of the Month blocks from three years ago. 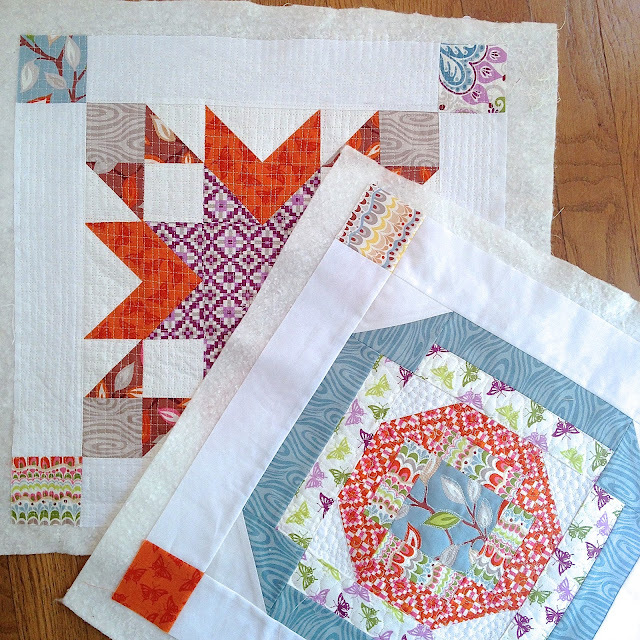 All of my piecing and quilting is with Aurifil 50wt. Block one is simple grid! I love the way it looks! Simple elegance! This week is block two and I am trying to find my free motion groove! I still need to figure out what I will be quilting on the rest of the block but I am pleased with my imperfect progress! Are you working on any WIPs this week? Started with 3 WIP projects. Baby boy arriving in August! First grandchild. Still a lot of work to do!!! how lovely to have a granddaughter about to be welcomed into the family. Quilt looks good, unpicking no fun though why does it take so long! Was feeling guilty as had not started the aurifil blocks for this year yet just printed them off but now seeing you are doing them from 3 years ago not feeling so bad! My daughter and son in law have been here, so no sewing for me. I am trying to get some UFOs completed or at least moved along toward completion. I am not getting very far very fast for sure. 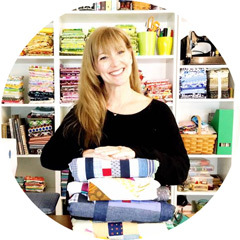 Love your grid quilting! Beautiful! Love that machine, too! And it's so hard to believe you're a grandma?? Of soon-to-be 3 grandkids?? Keep doing what you're doing, Kim--you look marvelous!! !